Memory Hold The Door Honorees. In 1958, the South Carolina Bar Association and the School of Law faculty established “Memory Hold the Door,” to preserve for the inspiration of future generations the spirit and the high ethical and professional standards of past leaders of the legal profession — by acclaiming and extolling their virtues. 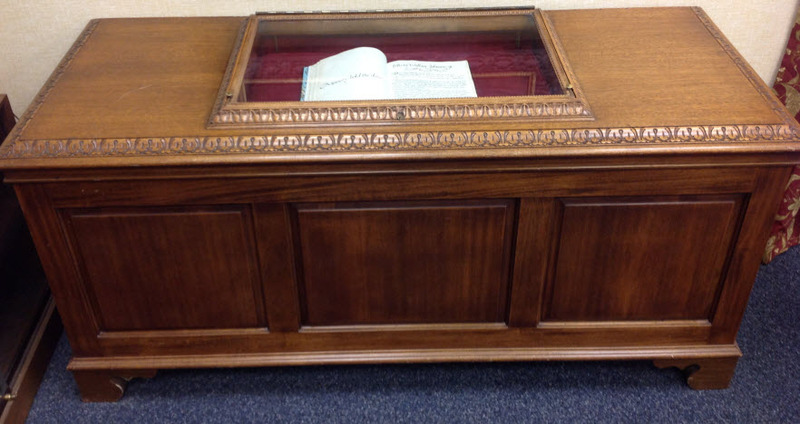 The University of South Carolina provided memorial books of finest quality and a handsome glass-topped mahogany repository. Memorial sketches of those selected to be memorialized are elegantly inscribed in a book. One page is turned each day; thus each sketch is displayed in rotation. An endowment is contributed for each person memorialized. Such gifts may be made by one person, by several, or by another group. The Honor Roll of memorials already so created is set out in the Roll of Inductees (available in chronological order from the left-side menu, and also in alphabetical order). The purpose of the endowment, as revealed by the transcript of the December 10, 1960 special meeting S.C. Bar, is to promote, through the School of Law, the welfare of the legal profession — by using the income for lectures, for research, for development of the School of Law faculty, and in other ways. Memorial gifts serve the double purpose of promoting the endowment aims and perpetuating the ideals of those thus remembered. The lawyers remembered in “Memory Hold the Door,” therefore, represent a true Honor Roll of the legal profession, selected by their fellow lawyers as best exemplifying the qualities of integrity, professionalism and skill required of the Bench and Bar.